A great way to maximize your travel is to minimize your costs. Today, TPG Senior Points & Miles Correspondent Nick Ewen explains how you can avoid spending money you don’t intend to while traveling abroad. When you travel, there are many ways to be ripped off. You might find an unscrupulous tour operator or an unlicensed taxi (like the one I encountered in Paris). Unfortunately, there are plenty of tricks that are perfectly legal but will still cost you. After my recent trip to Europe, I was reminded of one in particular: dynamic currency conversion. In this post, I want to help you get familiar with this nefarious money-making scheme so you can keep more cash in your pocket on your next international trip. Dynamic currency conversion is basically like setting your cash on fire. Image courtesy of Shutterstock. The idea behind dynamic currency conversion is pretty simple. When you make a purchase abroad, the merchant might ask whether you want to be charged in the local currency or your home currency. If you opt to pay in your home currency, the merchant converts the purchase from the local currency on your behalf. The problem is that the exchange rate is virtually guaranteed to be terrible, and there may be an additional fee for the service. Furthermore, those costs may not be disclosed to you up front. If you’ve ever heard the common saying, “There’s no such thing as a free lunch,” this is a perfect example. I smiled and politely responded, “Euros, please.” Sure enough, when the charge posted to my Barclaycard Arrival Plus World Elite Mastercard, it rang up at $60.53, saving me almost $3. In this particular case, the markup for paying in US dollars was roughly 4.8%. Bank of America touts the benefits of dynamic currency conversion to its business customers. The “convenience” is letting customers know exactly what they’re paying at the time of the transaction rather than having to wait for the charge to post online or show up in a monthly credit card statement. I’m all for convenience and will often pay for it, but saying that dynamic currency conversion is convenient is pretty disingenuous. It’s simply another way for banks (and merchants) to slip additional fees onto the bills of unsuspecting customers. One common misconception is that dynamic currency conversion is a good way to get around those pesky foreign transaction fees incurred by many credit cards. On the surface that makes sense: if you pay for a purchase in dollars (or your home currency), then it isn’t exactly a foreign transaction, and you shouldn’t have to pay a fee like the 3% that gets tacked on by the Citi / AAdvantage Platinum Select World Elite Mastercard … right? Notice that it doesn’t say purchases in a foreign currency; it simply references foreign purchases as a whole. This means that even if you accept a merchant’s offer to convert the transaction for you, you’ll still be subject to foreign transaction fees. Even worse, the fee will be higher because dynamic currency conversion will have increased the dollar amount of the purchase. Consider my earlier example, and pretend I accepted the jewelry store’s offer and used my Citi AAdvantage card for the purchase of $63.45. At the time the charge posted to my account, I’d see an additional charge of $1.90 from the card’s foreign transaction fee. That would increase my total to $65.35. By falling victim to dynamic currency conversion and assuming that that charge wouldn’t incur an additional fee on my credit card, I would have overpaid for my purchase by almost 8%! Fortunately, this is almost always avoidable, and by understanding how dynamic currency conversion works, you’ve already completed the first and most important step. When you’re traveling internationally and find a merchant who offers to convert your bill to your home currency, politely decline. Another key step is to have at least one credit card that doesn’t charge foreign transaction fees. While many of the most popular options have annual fees, there are many that do not (like the Capital One VentureOne Rewards Credit Card or the regular Barclaycard Arrival World Mastercard). There’s no sense in avoiding the fees of dynamic currency conversion if you then have to pay fees just for using the card! 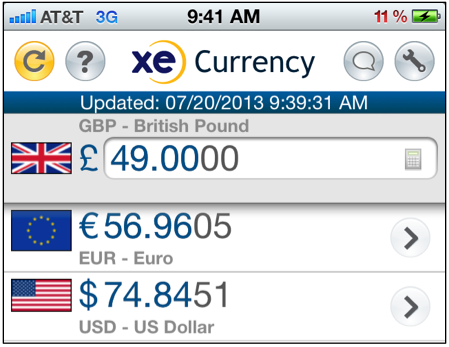 I use the XE currency app, which can help you identify dynamic currency conversion. You should also consider installing a currency conversion app on your phone to verify just how raw of a deal you’re being offered when you make a purchase. I use the app from XE, as it allows me to compare up to ten currencies, and can be refreshed with live market rates when you have access to Wi-Fi or data. It will then remember the most recent conversion rates when you’re offline, allowing you to check the conversion before you commit to a transaction. This is also helpful outside the dynamic currency conversion arena! While merchants should allow you to choose which currency you want to pay with, keep your eyes open for unsolicited dynamic currency conversion. TPG Points & Miles Editor Peter Rothbart recently encountered this in Spain, where several waiters proactively billed him in US dollars. Some merchants might do this malevolently, while others may actually believe that they’re helping — either way, it makes purchases more expensive. I always ask to see a bill at a restaurant before I pay to make sure that everything is correct (including the currency in which I’m being billed). When paying with foreign currency on PayPal, always have your card issuer convert the charge. Dynamic currency conversion may not be in the same category as travel scams, but it’s an easy way for you to spend more money than you should when you travel outside of the country. Knowledge is half the battle (or even more in this case), and I hope this post has given you some ideas for how to avoid this scheme on your next trip. What strategies do you have for avoiding dynamic currency conversion?